the original emerald will be seen Cracks or fine fiber fibers on the part of the stone. The fiber can be seen in plain view and there is also a need to use a magnifying glass to facilitate the lines that can be clearly seen. For fake or synthetic types of emerald can be distinguished from the surface that looks clear without fiber and can be used as a mirror or for mirroring. Stick the emerald on the cheeks, if it feels cold this is included in the characteristics of the original emerald. But this must be supported by several other characteristics as well. If it is held it will feel heavy for an object the size of it or dimensions, so it can be said that this stone can be said to be genuine. But if held feels light, when compared to objects the size of it can be sure the stone is fake. 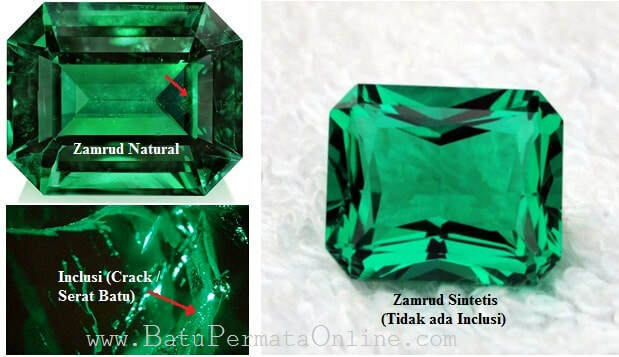 emerald can be said as a stone that is never clean, without caat and without blemish. This is because the stone has existed or formed for thousands of years and certainly will leave some parts of disability. This method might be avoided by doing a cutting process that serves to remove defective or bad parts. But physical disability is one of the characteristics that the gem is genuine. Emerald gemstones have a thick, beautiful color and the surface cannot be penetrated by any light. whereas synthetic gemstones are usually under ultraviolet light which will reflect light or not reddish and certainly this is not their nature. the emerald is usually cut with the faced form, namely cutting intersecting at each corner, this can be seen with a magnifying glass. The original stone has a perfect angle and not like a heated angle. The last emerald characteristic is having characteristics such as, inclusion, color, hardness and distinctive shape compared to synthetic stones. Why is that? Karema stone is formed naturally or not artificial. For the inclusion itself is formed due to cracks (cracks), foam or bubbles, black spots, the presence of foreign objects trapped in the stone, fingerprints or forms of fractures in the stone.